Hello prim friends!! Busy busy busy here! Today I finished up all the wrapping and preparing for Christmas so now I will have a couple of days to set back and relax...yeah right I am a clean freak so there is always something that needs to be cleaned. There's never any relaxing around here I'm always cleaning something...lol. We go to my parents house and my in laws for Christmas dinner so I dont have to worry about cooking I do get to enjoy a great meal without all the stress of preparing it. Here are the last of my Christmas pictures. Hope everyone has a wonderful Christmas with their friends and family!! Hello prim friends!! 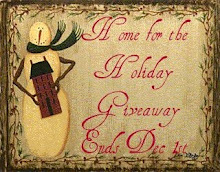 Just wanted to do a quick post to let you know about a great giveaway that Amy at Bumble Bee Lane is doing. The deadline is Dec. 1st so head on over to her blog and enter. Hope everyone had a great Halloween! Sorry I've been busy and have not had time to post. Halloween here was very cold brrr!! We even had snow on the ground, not as much as some of my blog friends...lol poor Amy at Bumble Bee Lane had 8 inches. We only had about an inch left because most had melted. My daughter Paige was dressed as a witch ( a nice witch as she called it...lol). My two boys Justin and Jordan don't really trick or treat anymore as they are 12 and 13 so they just dress up and give out candy and try to scare all the little goblins that are out. We had a birthday party bonn fire for my Jordan's 12th birthday on Saturday. His birthday is on Halloween but we always have is party earlier. Then on Sunday I worked on some projects that I am doing for a swap. My hubby and I are making a buttery for my kitchen and so we finished one part of it this weekend too. I'll post pics of the buttery later. Here is the exciting part! Tomorrow me and the hubby are leaving to go to Mt. Vernon, Ohio to the Simple Goods primitive antique show. I am so EXCITED!!! This is the first BIG prim show that I have been to because we don't have any big shows in our area. It is going to be so fun, for me of course..lol. Not sure how much fun the Mr. will be having but I am going to be having a blast. He says he will just find the food and that's where he will stay so I guess he'll be having fun too...lol. We are not taking any of the kids with us or at least we are planning on having no kids. My mother in law is watching them but Paige doesn't like being away from mommy so we will see. Jill Peterson is supposed to be there so I hope to get her new book and cookbook and have her sign them. I will post pictures of my prim finds when I get back. I received a great surprise package in the mail today! It was swap goodies from Eve at Lee Hill Primitives. Eve and I are partners for the Christmas at the Cabin swap that Amy from Bumble Bee Lane is hosting. Eve handmade everything for me. She is so talented. I love her prims! Thank you so much for everything Eve!! 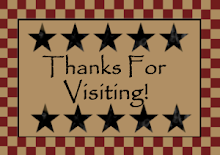 Thanks to Eve for all the wonderful prims! !